The governorship candidate of the Peoples Democratic Party, PDP, in Rivers State, Nyesom Wike, at a sensitization rally on non-violent election organized by the Grassroots Development Initiative, GDI, said that no one can issue ultimatums to the People’s Democratic Party PDP. 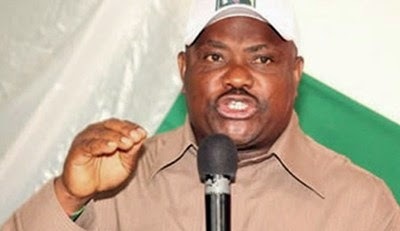 Last week, the Rivers Leaders and Elders Council, led by Chief Albert Horsfall, had handed the party a 7-day ultimatum to substitute the candidate of the party, Wike, with somebody from the riverine area, adding that it would be unfair for Wike, who is from Ikwerre to succeed Governor Rotimi Amaechi, who is also from Ikwerre area of the state. Wike has however, described the ultimatum as an empty threat saying “Nobody can sit in his house and give directives. You cannot be in your house and say, I direct Riverine, because we refused your children from flying the flags of PDP for the House of Representatives. Elder statesmen do not talk anyhow. Theirs is to make peace and not incite the polity. The PDP Elders Forum in a statement given by Chief Ferdinand Alabraba, condemned the ultimatum, describing the call by the Horsfall led group as undemocratic.